A handsome tower that is as just about as good as the fine pre-war apartment towers that it emulates, Trafalgar House is sedate and dignified and one of the city's best Post-Modern designs. A fine detail is the corner limestone trim of the base, which reduces in size as it ascends, a rather original treatment. 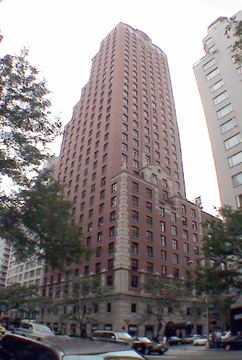 With its handsome red brick and limestone trim, the tower rises with setbacks a relatively modest 31 floors with nice Italian-Renaissance-style detailing. An article by Joseph Giovannini in the October 13, 1986 edition of The New York Times said that its "associations are so genteel and the building so urbanistically polite that the building hardly seems "as tall as it is." It has only 100 condominium apartments. Although it does not have a garage, or a health club, it does offer an atrium lounge with catering service, a nursery and valet services. Kohn, Pedersen, Fox Associates, one of the nation's premier architectural firms for office buildings since the late 1970's, designed the tower for Allan Boardman. 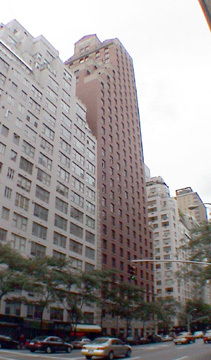 Seventieth Street has long been one of the city's supreme residential blocks and this tower, which opened in 1986, in no way diminishes that prestige.